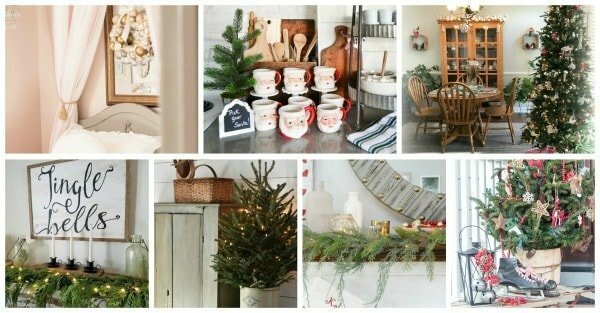 Christmas Kitchen Tour that is festive, easy and won't break the bank. 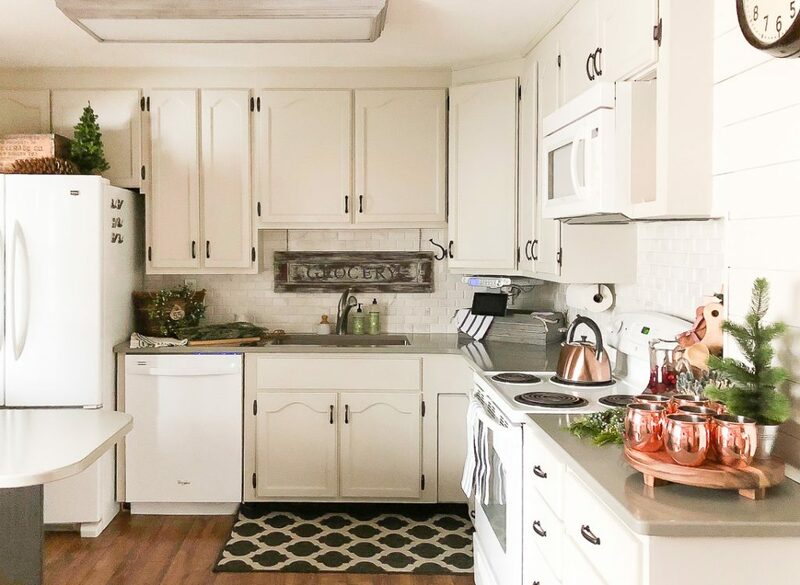 Just like everyone else, our kitchen is the hub of the home. It is our busy room, the place that gets used the most and the room we are in all the time. Just like the rest of our home, our kitchen is small. A couple of years ago, we DIYed a kitchen makeover that has made the biggest difference in our kitchen. The small things we did, made us love our kitchen more. It didn’t function the best before and it was so orange that I felt like I stepped back into a 1970’s sitcom every time I was in it. 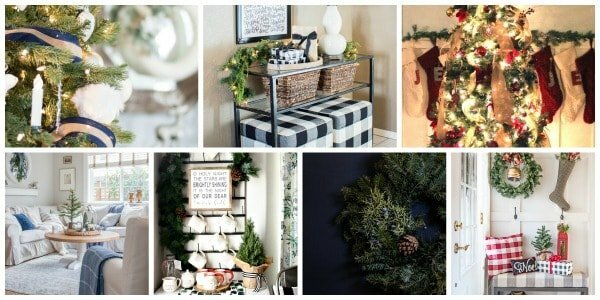 Since the makeover, the kitchen has become a fun spot to decorate and “set up” when we entertain. 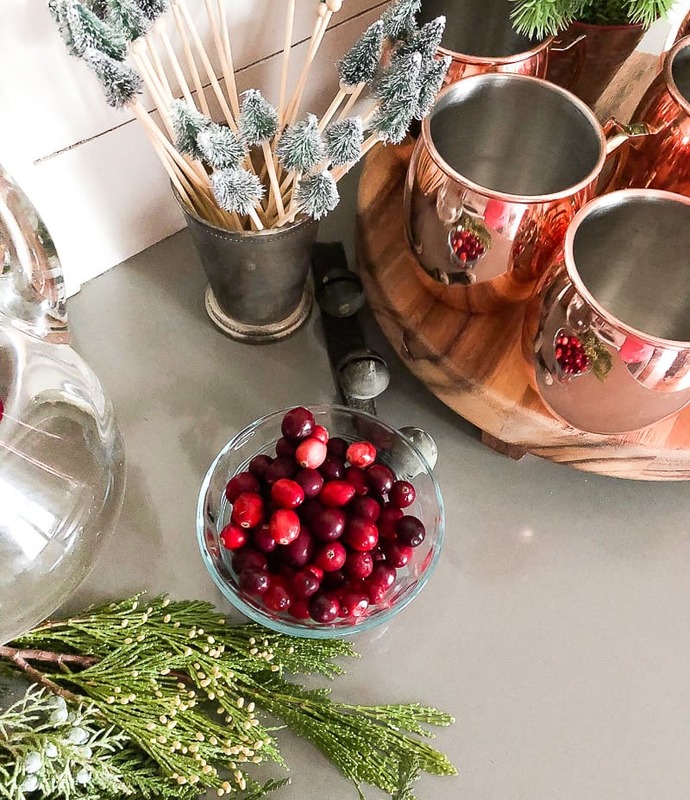 For this Christmas Kitchen Tour, I set up the kitchen like I will when we are making Moscow Mules and celebrating this season! It is the simple touches added here and there that make the biggest impact. This tour was made possible by some frugal shopping. I bought the copper mugs on clearance two years ago. I bought the greenery and a bag of cranberries at Walmart while I was there. The tree was a Target dollar spot find and the Christmas tree stirrers were a Target clearance find last year. The glass pitcher was a yard sale find and then beautiful wood stand is from the Hearth & Hand line at Target. I would normally never buy greenery at a store, but while I was at Walmart, I couldn’t pass up the big bunch of holiday greenery for $3.50. We have been so busy fixing up the duplex that I am taking all the help I can get to get everything else done. 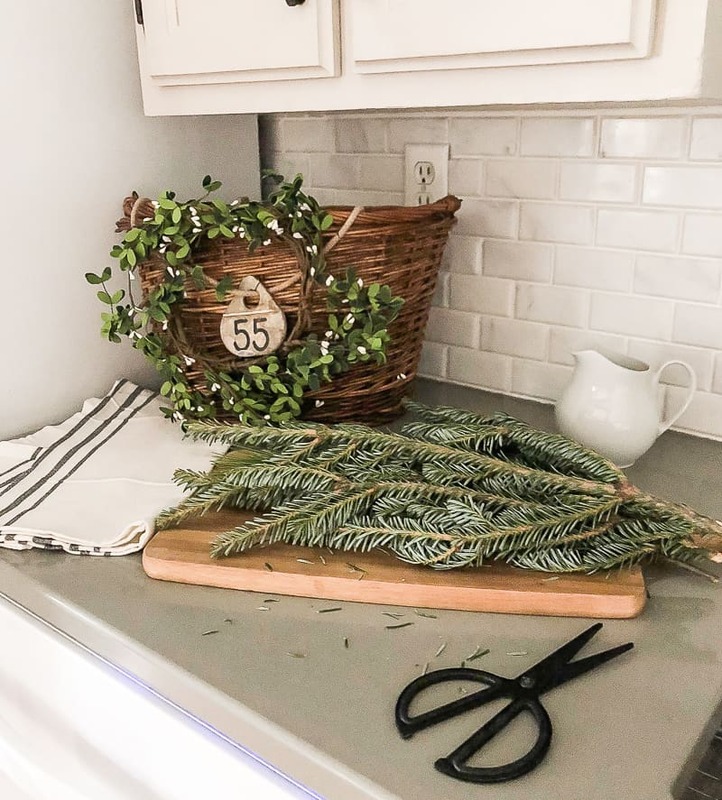 I didn’t add a lot of decor to the Christmas Kitchen Tour because I don’t want to have to move it all when I am working in there every day. Any more, I am finding that the simpler, the better for me. A few touches of green in any room makes me happy. 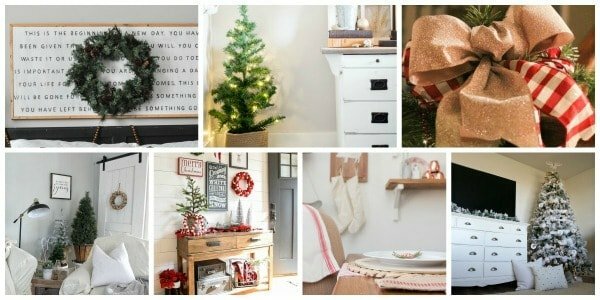 How do you add Christmas to your kitchen? 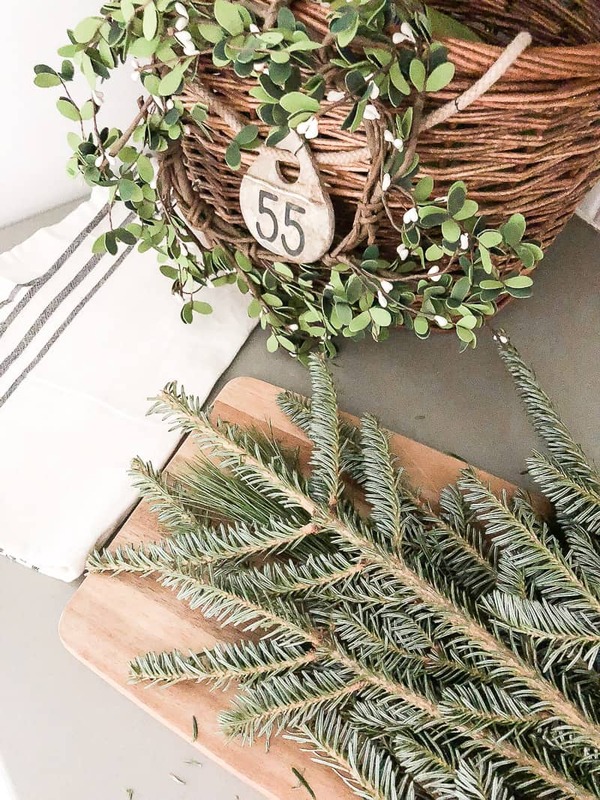 You can shop the items I used in this Christmas Kitchen Tour below! Make sure to stop by all of my friends’ posts! They are GORGEOUS! 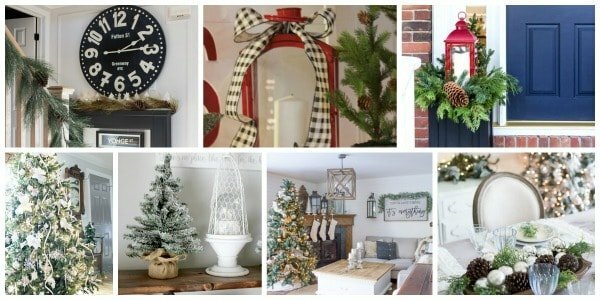 Everything is so cute and festive, I wish I could come over for a cup of holiday cheer! Love those mugs and those adorable stir sticks – what a find! 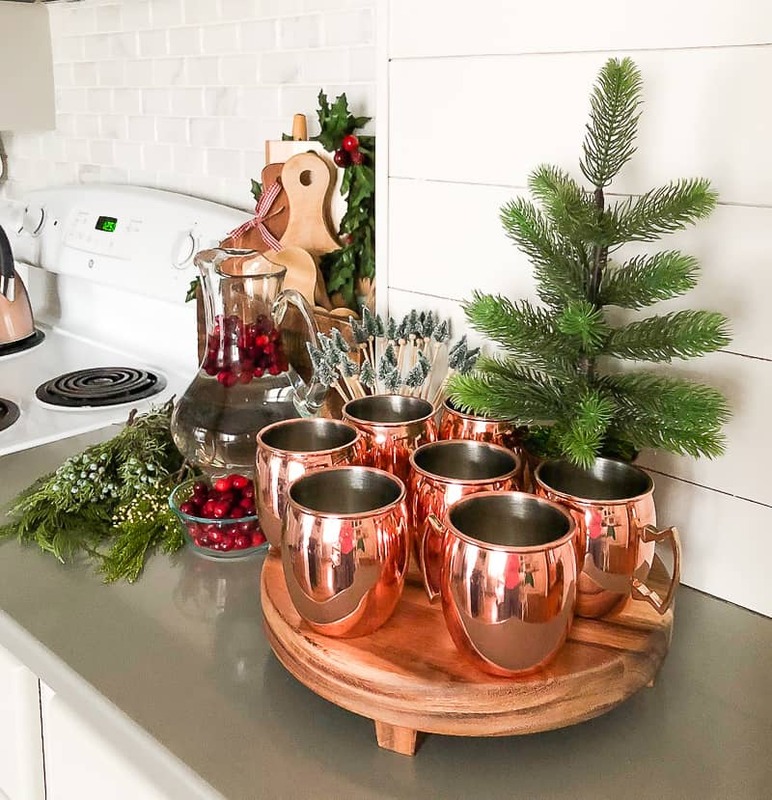 Your kitchen looks so beautiful, I love that copper mule bar especially!! Merry Christmas! Always fun to hop with you! Thank yoU! Adorable Kitchen Lindsay! I love all the added greenery and the copper! 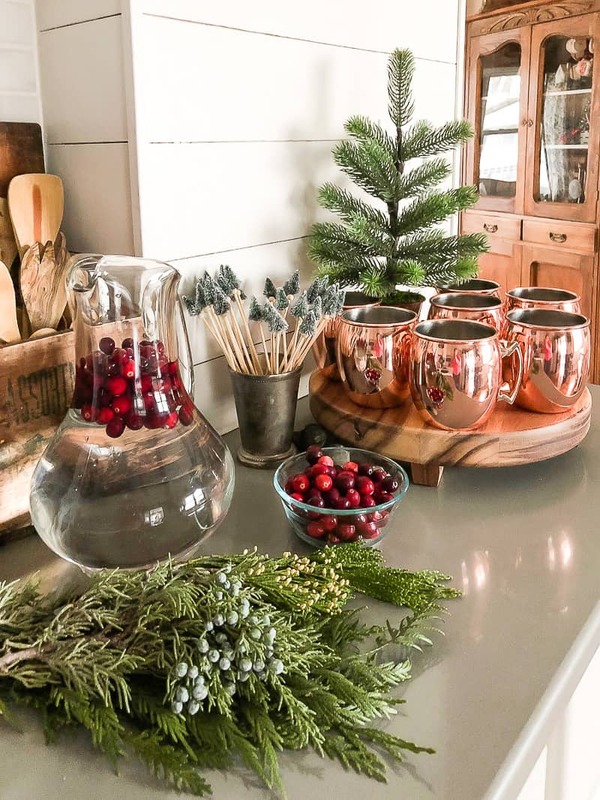 Lindsay, I love the copper punch of color for the Moscow Mule station. That area alone makes such a pretty Christmas statement. And, yes, I think the garland is supposed to smell. But the price makes it worth it. Lindsay! I am loving all the details in this kitchen! Those stirrers are the cutest thing ever! Target Hot Spot find last year! Thank you! Everything is so pretty! I love that Moscow Mule bar! I need to put one of those in my living room. Such a great idea! Lindsay, you kitchen is stunning! I’m with you on keeping it simple in the kitchen. Every touch you have added is lovely. Beautiful kitchen! Don’t you just love those copper mugs! You kitchen is so lovely! 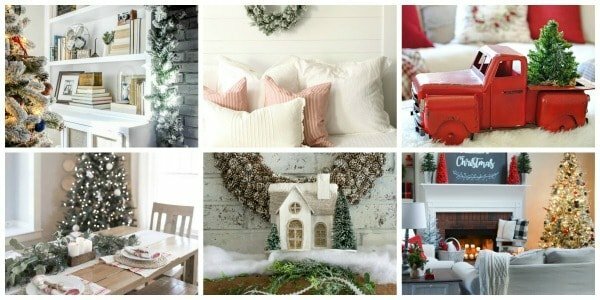 Love the simple Christmas decor! Hope you have a wonderful Christmas!